John Hite, son of Wyatt Hite and Nancy Summey. Death certificate lists his middle name as Tobe. 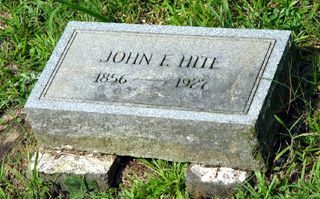 Mr. John F. Hite, 70 years of age, well known character about town for a generation, died at his home south of town last Sunday, and was buried Monday at Macedonia Church. Funeral arrangements were in charge of Jackson funeral directors. Surviving are Mrs. Mary Cox, a sister, and Sam Tobe Hite, a brother.